On a night when five track records were broken, a French horse not named Goldikova won a third straight championship-level turf race and a European-based first-time-on-dirt runner pulverized a quality field to earn a starting gate at Churchill Downs on the first Saturday in May, it was a Kentucky Derby entry who refused to run last year that ran away with the night’s biggest prize. Godolphin Racing’s Thunder Snow famously refused to run at the opening bell of last year’s Kentucky Derby and was pulled up. But the Darley-bred 4-year-old son of Helmet confirmed Dorothy’s observation that “There’s no place like home” by getting an early lead and extending his advantage over American favorite West Coast to coast to a track record victory in the 1 1/4-mile Group 1 Dubai World Cup. Thunder Snow has never finished worse than second on Meydan dirt. Previous Dubai-based UAE Derby winner Mubtaahij, now conditioned in the U.S. with West Coast in Bob Baffert’s stable, was nudged out by his stablemate and finished third. All eyes were on other competitors: West Coast of course as the newest star in trainer Baffert’s twinkling universe; Breeders’ Cup Turf winner Talismanic, making his first start on dirt; and reigning American Champion mare Forever Unbridled, striding to become the first female winner of the $10 million race under the guidance of Hall of Fame rider Mike Smith. The horse that changed the complexion of the race actually finished last in the unusually small 10-horse field. North America won the Maktoum Challenge Round 3 and was expected to be the early speed and set a fast pace ripe for a strong closing challenge by long-striding West Coast. He was the feel-good story of this Dubai World Cup Carnival season and long-time local trainer Satish Seemar’s first World Cup threat after being purchased for only $38,000 at the April 2016 Godolphin sale. But the 6-year-old son of Dubawi badly missed the start, was trapped at the back of the pack and never able to establish that fast pace. Christophe Soumillon on Thunder Snow seized the unexpected advantage. He gained the early lead and set a slower pace, then burst ahead when urged at the top of the stretch. West Coast had nothing left to mount the expected challenge and the Kentucky Derby runner who wouldn’t did the rest by 5 3/4 lengths in track record time of 2:01.38. In the futuristic-looking city that has a Minister of Happiness and likes to imagine only big things, it appears dreams can come true. 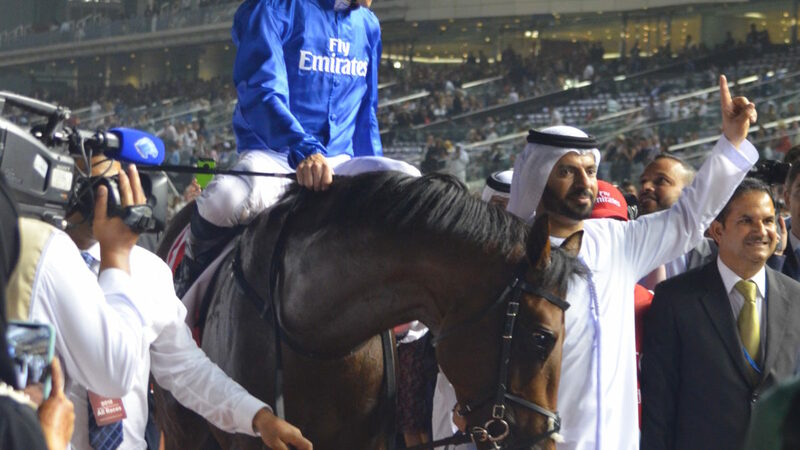 Thunder Snow’s victory might have been enough on a night that annually provides an ample number of thrills, but this edition of the Dubai World Cup night outdid its own reputation. The big race aside, the race of the night was provided again in the $2 million Group 2 UAE Derby for 3-year-olds. Aidan O’Brien-trained Mendelssohn had everyone wondering why he began his career on turf after a rhapsodic performance. The swift half-brother of Champion mare Beholder (both out of Leslie’s Lady) buried eight competitors by 18 1/2 lengths in a track record 1:55.19 over 1900 meters of Meydan dirt with champion European rider Ryan Moore at the helm. Rayya, the filly who enjoyed a successful Carnival for local trainer Doug Watson, including a UAE Oaks win, finished a very distant second but is still headed for a gate in the Kentucky Oaks. American runner Reride finished third and Godolphin’s Gold Town rounded out the top four. “I knew he was good, but I never expected that,” said O’Brien of his charge’s jaw-dropping performance. “He’s still a bit green, but he handled well,” understated Moore. There was no certain word from either trainer or jockey on who would pick up the Derby ride. Mendelssohn is certain to be a crowd favorite during Derby week. He gained a large press following at track work during World Cup week for his endearing habit of nonstop nickering during workouts, obviously enjoying himself and the attention he gained. Earlier in the evening, jockey Soumillon gained his first of two wins, guiding France’s Vazirabad to a record third consecutive win in the $1 million Group 2 Dubai Gold Cup over 16 turf furlongs. Trained in Europe by Alain De Royer Dupre, the 6-year-old gelded son of Manduro accomplished his hat trick by closing late in track record time of 3:17.92. Sheikhzayedroad finished a length off with Godolphin’s Rare Rhythm third. The six-furlong $2 million Group 1 Golden Shaheen was supposed to belong to American sprinter Roy H, but X Y Jet seemed in command until the final few meters when last year’s winner, Mind Your Biscuits minded his by closing late near the finish line to gain the consecutive win on the dirt in yet another track record time of 1:10.12. X Y Jet held second while favored Roy H could do no better than third. The 12-year-old wonder and locally beloved Reynaldothewizard entered a gate for the 31st time and ran well, but finished last in a tightly packed nine-horse field. Jungle Cat clawed out a victory in the $1 million Group 1 turf six-furlong Al Quoz Sprint. He gave Godolphin trainer Charlie Appleby his first Dubai World Cup day win and the first of his two wins on the card, gaining a distinct advantage when stablemate favorite Blue Point was scratched at the gate. Stormy Liberal was a conservative second with Conquest Tsunami third. Appleby gained a second success in the $6 million 12-furlong Group 1 turf Sheema Classic. Hawkbill proved difficult to load into the gate but impossible to catch once it opened, besting Poet’s Word and favorite Cloth of Stars. The nine-furlong $6 million Group 1 Dubai Turf gave hometown Godolphin its third of four wins on the evening as Benbatl won the battle over Japanese hopefuls Vivlos and Real Steel. The win also gave trainer bin Suroor a World Cup day double. Heavy Metal put his hooves to it in the $1 million Group 2 Godolphin Mile that opened the card. The 8-year-old gelding was a favorite in the full field of 14 and lived up to that status, besting Muntazah and Japan’s Adirato. The Purebred Arabians were not to be left out on the record-breaking evening. Tallaab Al Khalediah journeyed from gate 10 across 1 1/4 miles of Meydan sand in track-record fashion, arriving at the finish in front of runnerup Chaddad and Barnamaj in the Dubai World Cup day’s traditional $1 million Al Kahayla Classic. The Dubai World Cup closes the racing season in the UAE. This year’s edition leaves racing fans to dream of what wondrous feats will take place during next year’s magical Meydan Arabian Night, Saturday March 30, 2019. Until then, masalamah (Goodbye) from Dubai.